Rugged steel chassis with baked white enamel finishing. Flush, stem or row mounting. Can be hung individually or in continuous runs. 20 degree Fahrenheit starting temperature. 4-1/4" width x 3" depth. Lamps not included. 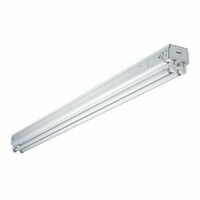 Fixture can be mounted individually or in continuous rows for surface or suspended mounting. Applications include light commercial, industrial, retail, coves and displays. Heavy-duty channel is die-formed from 22-gauge steel. Channel cover snaps to housing for easy access to wire way. Electrical connections are made inside the wire way. Standard mounting holes and wiring knockouts are included. Housing is finished in lighting grade white baked gloss enamel paint. No diffuser, fluorescent lamp is exposed. 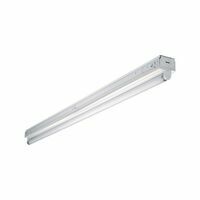 For use with 59 watt, 96" T8 slimline linear lamps. The fixture is cULus listed for damp locations.